If you know me, or follow my blog, you know I've had a rough few weeks. My mom died near the end of February, and we took a trip back to North Dakota for the funeral. I ended up staying another couple weeks, sending my family back home. We are only now, finally, getting back to any semblance of 'normal' around here. One thing that screams normal to me is a family movie night. So it was amazingly wonderful to have a DVD waiting for us from Family Christian when I got home. Something I could watch with my family, and start transitioning into a new normal. Confessions of a Prodigal Son was even more fun because we know the family of the main character (Nathan Clarkson) a little bit. We used to do some computer classes with his little sister. Confessions of a Prodigal Son is a coming-of-age tale following Sean as he rebels and leaves his home, family and father to figure out life on his own. Two years later--while still on the journey to find life's answers--Sean suddenly finds himself questioning everything he thought he knew as he is confronted by a professor who challenges Sean to see his life as a story; a best friend walking a dangerous path; and a strong and beautiful young woman who is on her own journey to answers. Each one of these elements causes Sean to greater examine the choices he is making. The story is one of drama, laughter, relationships, faith, and redemption, ultimately asking the question: can broken stories have happy endings? Starring Kevin Sorbo (God's Not Dead, Hercules), Nathan Clarkson (The Veil, Mayflower 2), Rachael Lee (Greek), and Azel James (Book of Daniel). We were all familiar with the story of the Prodigal Son. Son takes his inheritance, leaves home, spends it foolishly, loses everything, ends up working a horrid job, and finally goes back home, where he is surprised to be welcomed joyfully. 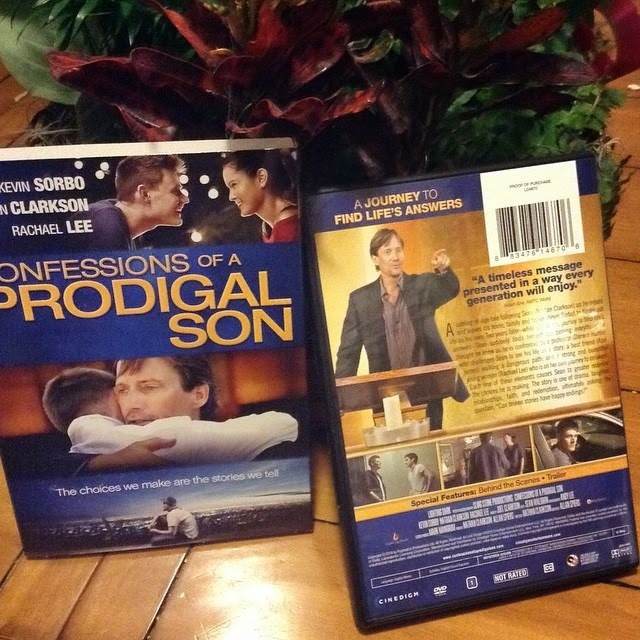 This is a modern retelling, where Sean (Nathan Clarkson) has turned his back on his pastor-father's (Kevin Sorbo) beliefs, taken his college fund, and headed off to make his own decisions and lead his own life. It's been almost two years, and things are starting to fall apart. Parts of it are almost painful to watch, as you know that actions have consequences. Sean is about to figure that out. My teens struggled a bit with the message here, thinking that it boiled down to "growing up leads to horrible stuff going wrong." It led to some interesting conversations. Dumb decisions and stupid choices are very likely to eventually lead to some nightmarish results. Responsible choices are likely to lead to much better results. And trusting God is one of those responsible choices. I have a $10 Appreciation Certificate to Family Christian to give away. You can use that towards the purchase of your own copy of Confessions of a Prodigal Son (which is $15.99 right now), or anything else you want.